3 View logs on JN! Welcome to Jellyneo's Lab Ray Logger! With our tool, you can automatically record your daily lab zaps with our handy dandy extension, available for Chrome, Firefox, Safari and Opera. You have space to add all of your pets. There are no limits. Add your regular lab rat, and any random pets you might pick up to zap! 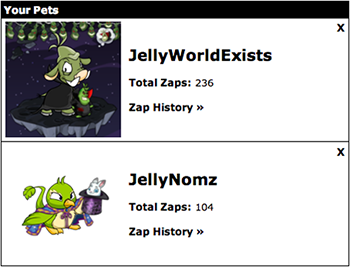 Each zap is recorded on Jellyneo, and fully sortable. 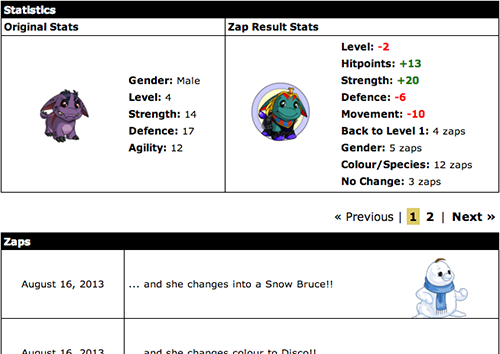 Check out your pet's original stats, along with cumulative totals for each zap type. To use our service, you'll need to log into your jnAccount. Don't have one? Register one today!